Diane Sawyer, Kathy Brock, and index cards? – Write with us! Diane Sawyer, Kathy Brock, and index cards? Today I attended the Chicago Network’s 22nd Annual Women in the Forefront Luncheon (WIFL) where ABC7 Chicago anchorwoman Kathy Brock interviewed Diane Sawyer. In a room filled with over 1300 professional women (and a few men) Kathy entered the room in a very nice black dress along side the fantastic Diane Sawyer in at least 5 inch heals with red soles. I decided after attending this luncheon that it’s time to go shopping. But as I scanned the room for tips on style and fashion, I noticed some women taking notes and jotting memorable quotes from Sawyer. I must say, while I need to go shopping for clothing, some in the room should consider new writing instruments! But what surprised me most, but not really, were the tools that Kathy Brock used during her interview; a stack of index cards (with red notes) held together by a black binder clip. Yep, in the height of the digital revolution and in a room filled with over 1300 female powerhouses, Kathy relied on handwritten notes on 3X5, lined, white index cards and a black clip. 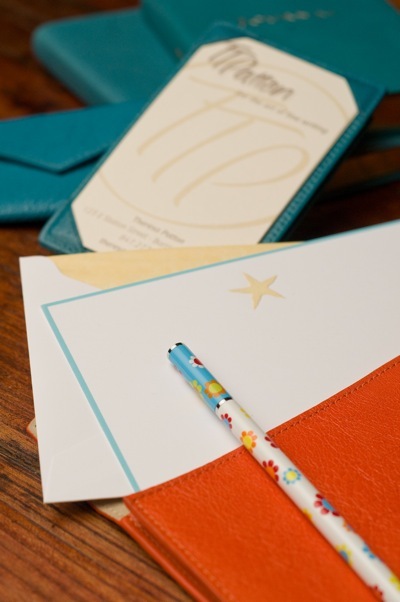 Well, Kathy, just in case you stumble on this blog, the jotter (shown in turquoise in the photo) comes in 8 colors of leather and holds 3×5 cards for only $40! And the orange envelope comes in just as many colors and will also hold your 3×5 cards. You can get one to match every outfit. Other than that, the luncheon was fantastic! I learned firsthand that Chicago is filled with talented and accomplished women. I have to remember to thank my host for the invitation….in a handwritten note of course. Hi Diana, I have heard from a friend, Kevin Mottus n I have been reading a lot in regards wi-fi n all the negative side effects we received, my friend is trying to do more by making us aware of it, he has a lot of research but seems all of it is hush hush. What can u tell me about it! Thx Gilda P.S.please I like to hear from you! Previous Post You’ll write to me won’t you CC?